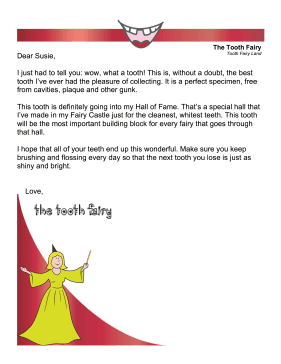 Only the very best and cleanest teeth can receive this letter praising a child's good dental hygiene. I just had to tell you: wow, what a tooth! This is, without a doubt, the best tooth I've ever had the pleasure of collecting. It is a perfect specimen, free from cavities, plaque and other gunk. This tooth is definitely going into my Hall of Fame. That's a special hall that I've made in my Fairy Castle just for the cleanest, whitest teeth. This tooth will be the most important building block for every fairy that goes through that hall. I hope that all of your teeth end up this wonderful. Make sure you keep brushing and flossing every day so that the next tooth you lose is just as shiny and bright.